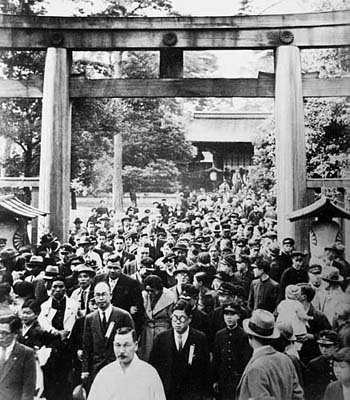 In 1908 professional American baseball teams began traveling to Japan to play exhibition games against college ball clubs and promote the sport of baseball. But it wasn’t until the “Sultan of Swat” Babe Ruth and 13 other U.S. baseball All-Stars (including Lou Gehrig, Jimmie Foxx, Lefty Gomez and Earl Averill) took their mega-watt star power on a barnstorming tour of the Far East after the 1934 season, that Major League Baseball captured the attention of fans in Japan and other Far East countries. Fueled by Ruth’s larger than life persona and massive physical size, the tour wowed crowds all over the Far East including many thousands who lined the streets in Japanese cities that hosted exhibition games. Riding in a motorcade and treated like visiting royalty everywhere he went, Ruth was greeted by a multitude of cheering Japanese. The tour was considered a great success for further increasing the popularity of baseball in Japan. It both encouraged and motivated media magnate Matsutara Shoriki, who had considered disbanding his Japanese team. After they honored themselves by making a strong showing against the American stars, Shoriki kept the team together. In fact, his renewed enthusiasm for the game led him to establish Japan's first professional team, the Great Tokyo Kyojin baseball club one month later in December of 1934. This team traveled to the United States in 1935, playing against amateur, college and Minor League teams. At the end of the tour, the team's name was changed to the Yomiuri Tokyo Giants - a team that still exists today and is one of Japan's best. 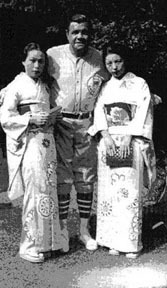 Shoriki later became known as "the great genius-father figure’ of Japanese baseball." Many accredit the 1934 barnstorming tour as a big factor in making professional baseball possible in Japan. When the Honorable Ryozo Kato, Japanese Ambassador to the U.S., was asked if the 1934 Tour was a contributing factor to pro baseball in Japan, he replied: "Yes, very much so. I attribute this to the 'Babe Ruth effect.' His performance during that tour excited both the diehard and casual fan." 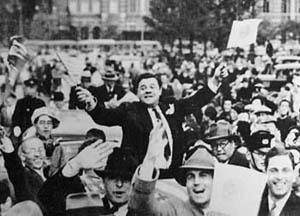 To this day, Babe Ruth is still a very popular sports figure in Japan and considered to have been an international ambassador for the game of baseball. In 2002, a statue of Babe Ruth was built and placed in Yagiyama Zoological Park in Sendai City - the exact point where Babe hit his first home run in Japan during Game 4 of the tournament at Miyagi Prefecture Yagiyama Baseball Stadium - ground that is now the zoological park.